MC6-Ex is an accurate, intrinsically safe (IS), documenting, multifunction field calibrator and communicator that calibrates pressure, temperature and electrical signals, and contains a field communicator for HART, Foundation fieldbus and Profibus PA instruments. It's an easy-to-use, IEC- and ATEX-certified calibrator that can be deployed in any Ex Zone/Division, even in the most demanding Zone 0/Division 1. MC6-Ex also communicates with Beamex calibration software, enabling automated, paperless calibration. Jofra reference temperature calibrator (RTC) 187 provides temperature measurement from -45 °C to 180 °C, which is an increase of 25° C over its previous temperature-range-leading product. Its top temperature of 180 °C is the hottest available for a calibrator that can also perform cold temperature calibrations. RTC-187 also features Ametek's patent-pending Dynamic Load Compensation (DLC) system that provides temperature uniformity. It also works with JofraCloud to permit real-time remote calibration. PIE 525Plus diagnostic thermocouple, RTD and milliamp calibrator offers accurate temperature calibration, is a milliamp calibrator that can source and read up to 24 mA, simulate two-wire transmitters, and power and measure 24-V transmitters or other control instruments. 525Plus includes patented (U.S. 7,248,058) current leak detection that protects against failures. It combines with EZ as PIE software's double click menu for troubleshooting RTD sensors and wiring, and can also measure resistance before burnout. iTherm TrustSens hygienic RTD is reported to be the world's first self-calibrating temperature sensor, provides documentation of up to 350 calibrations to meet regulations, and avoids the risk of undetected drift. TrustSens has a built-in, high-precision ceramic reference based on the Curie point of the reference material. It measures temperatures from -40 to 160 °C (-40 to 320 °F), works in pressures up to 725 psi, and provides a 4-20 mA output with HART. AMS Device View asset management and scheduling software has added support for Beamex MC6 documenting calibrators, which adds electronic workflows that are reported to eliminate 50% of time spent on each calibration. 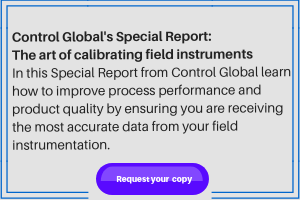 AMS Device Manager’s Calibration Assistant Snap-On application interfaces with MC6 to manage calibrations of HART, Foundation fieldbus and conventional devices. Users can paperlessly define, track and test calibrations with a seamless interface between AMS Device Manager and MC6. DeviceSync is a web-based application that provides a rapid, secure method of data transfer for documenting calibrators. Assignments and results move over a cloud-computing connection, enabling robust and performant workflows for remote technicians with an Internet connection. Software required includes standard Windows OS, DeviceSync and ProCalV5 or ProCal Direct (version 5.8.0.4 or higher). Compatible calibrators include Fluke 729, Fluke 743B, 744, 754 and 753, and Honeywell 2020 and Beta 990. This webinar explains how often should instruments be calibrated.